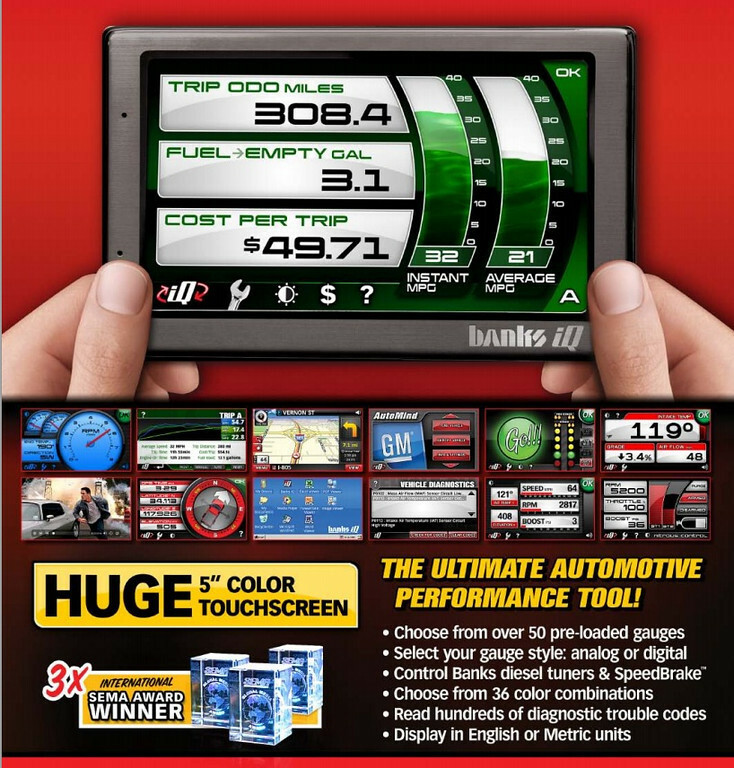 Banks introduces its highly-anticipated Banks iQ for gas and diesel OBDII cars and trucks. 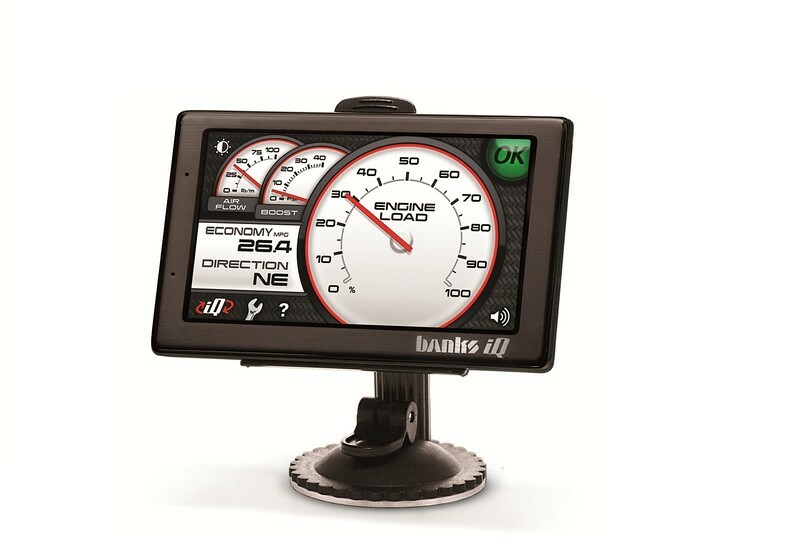 This 5” touch-screen device, essentially a pint-sized PC, revolutionizes the vehicle user interface market by not only delivering vital-systems-awareness and a host of user-selectable gauges, but by also offering total control over Banks tuning, flash programming and Speed Brake diesel exhaust braking products. Whether your interest is street performance (Automind programming module or Six-Gun diesel tuner) or all-out racing calibrations (Speed-Loader), over 50 years of record-setting automotive knowledge by the only company with national records and world championships is crammed into every product. The Banks iQ allows you to choose from multiple tunes including Economy, adjust or remove rev limiters, calibrate your speedometer, adjust shift points and more right from the full color 5” touchscreen. In addition to a host of user-selectable gauges and market-exclusive software and utilities, the Banks iQ can be removed easily from the vehicle and used anywhere because of its built-in rechargeable battery. Review logged performance data, keep track of the vehicle’s fuel usage through the iQ’s precision Economy mode, use its built-in GPS capabilities and even enjoy movies or music on the road or anywhere life takes you. The Banks iQ is fully expandable and upgradable. A growing stable of optional micro-computer controlled add-on performance and safety peripherals are in development, including: nitrous control, a true on-board dyno system, water/methanol injection, turbo timer, air density meter, air/fuel ratio meter, propane injection, TransCommand® and more. You'll always be able to run the latest software and download a host of new programs as they become available, too! About Gale Banks Engineering: For more than 50 years, Gale Banks Engineering has been an industry leader in designing, manufacturing and marketing specialized performance products for gas and diesel cars, trucks and motorhomes; and providing solutions for challenging marine and defense industry applications.